Modern Mormon Men: Guest Post: How Would You Have Answered This Investigator’s Question? Guest Post: How Would You Have Answered This Investigator’s Question? Last week I was invited by the missionaries in my ward to join them as they met with an investigator. The lesson was about the Word of Wisdom. The lesson went well. The investigator had some great insights and great questions, which we answered to the best of our ability. But our friend was confused about the alcohol part. 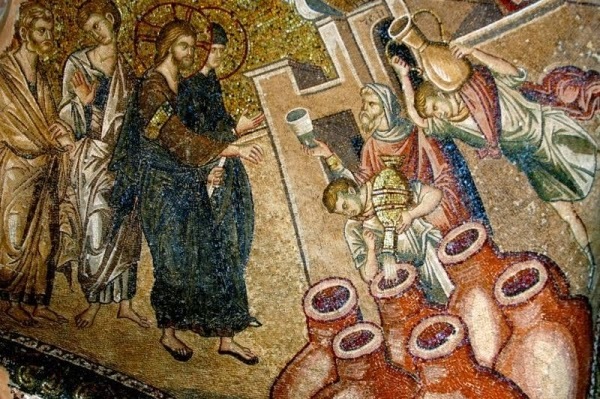 If Jesus drank wine, she wondered, how could alcohol consumption be a sin? We explained that the prohibition of alcohol wasn't a commandment back then, but it was now. And this is where she asked a question that none of us had a good answer for. She said that if God is eternal and has been the same forever and ever, and if time is meaningless to God, it would make sense for him to be in any situation in any period of [our] time and still be sinless and blameless. Were that not the case, he would cease to be the perfect God that we know him to be. She said that it didn't make sense that Jesus would be a sinner if he were here with us today, but by our definition, he would be a sinner because he has drunk wine. That's an interesting point that I had never really thought of before, and I felt that none of our answers were very satisfactory. One of the missionaries replied that he didn't know if what he was about to say was true or not (rarely a good sign in a church setting), but that he heard that the wine they used back in the day was really just grape juice. I reminded him that there are instances in just about every book of scripture we have of people getting drunk from wine. You don't get drunk off of grape juice. I wanted to say something about how God can do whatever he wants, and that if he made the commandments, he can break them, but the idea of God breaking his own commandments didn't sit very well with me, so I didn't mention it. The missionaries kept coming back to the "if you know the Book of Mormon is true and that Joseph Smith was a prophet, the answer to your question really isn't important" thing (though they said it nicer than that). I found this answer unsatisfying and a bit too dismissive of a genuine concern, but I didn't have anything better to say. Now that I've had some time to think about it, the only insight I can think of has to do with Christ's fulfilling of and putting an end to the Law of Moses. It makes sense to me that somehow if a resurrected (that is, post-Law of Moses) Christ went back in time to Law of Moses days (which itself is a confusing thought, given that time is irrelevant to God), he would still have offered sacrifices and done everything else that the Law of Moses required, because they were commandments. But if a resurrected Christ were to appear to us today, he wouldn't drink the wine for the same reason—it's a commandment. God stays the same, but the commandments change. So it makes sense that God can make or break commandments—not break in the sense of sinning, but break in the sense of making that commandment no longer a commandment. We even have Jesus giving his disciples a new commandment in John 13:34: "A new commandment I give unto you, That ye love one another; as I have loved you, that ye also love one another." See how confusing this all is? Help me out here, guys. What do you think? Is our friend's premise (that God should remain sinless no matter the time period or situation) a sound one? How would you have addressed her concern? And how do you reconcile the fact that Jesus drank wine—not to mention the fact that wine is clearly mentioned in the sacrament prayers found in the Book of Mormon and Doctrine and Covenants—with the LDS Church's current prohibition on the stuff? PGH is a late twenty-something who grew up in the Church and served a mission in Eastern Europe. He blogs about Mormon stuff at Mormono. He can't stand seafood. Read PGH's previous guest post here.